Jacobs Technology Inc., Tullahoma, Tenn., is being awarded an indefinite-delivery/indefinite-quantity contract with an estimated maximum value of $4,600,000,000. A fixed-price incentive task order in the amount of $4,317,327 is being issued concurrent with the contract award. The predominant contract types will be cost-plus-incentive-fee and fixed-price incentive. Under this follow-on contract, the contractor provides products and services supporting concurrent test, training and operations for missions executed by or through the Missile Defense Integration and Operations Center mission execution platform, and the execution of the Missile Defense Agency enterprise communications and information technology environment. The work will be performed predominantly in Schriever Air Force Base, Colo.; Huntsville, Ala.; Fort Belvoir, Va.; and Dahlgren, Va.. Fiscal 2017 research, development, test and evaluation funds in the amount of $4,000,000 are being obligated on this task order. The ordering period is from Aug. 9, 2017, through Aug. 8, 2022, and may be extended to 8.5 years via execution of award terms and an option; extension(s) will not affect the estimated maximum value identified above. This contract was competitively procured via publication on the Federal Business Opportunities website with two proposals received. The Missile Defense Agency, Schriever Air Force Base, Colo., is the contracting activity (HQ079617D0001). American States Utility Services Inc., San Dimas, Calif., has been awarded a $192,411,358 modification (P00007) to a 50-year contract (SP0600-16-C-8311) with no option periods for additional utility services for the water and wastewater systems at Eglin Air Force Base, Fla. This is a fixed-price with economic-price-adjustment contract. Locations of performance are California, and Florida, with a June 14, 2067, performance completion date. Using military service is Air Force. Type of appropriation is fiscal 2017 through 2067 Air Force operations and maintenance funds. The contracting activity is the Defense Logistics Agency Energy, Fort Belvoir, Va.
Lockheed Martin Space Systems Co., Littleton, Colo., has been awarded a $45,482,492 cost-plus-incentive-fee modification (P00450) for military code (M-Code) early use software. The contract will enable M-Code tasking, monitoring, and signal in space for current and future global positioning system satellites. Work will be performed in Maryland, Pennsylvania, and Colorado, and is expected to be completed December 2019. This award is the result of a sole-source acquisition. Fiscal 2017 research and development funds in the amount of $15,300,000 are being obligated at the time of award. Space and Missile Systems Center, Los Angeles Air Force Base, Calif., is the contracting activity (FA8807-08-C-0010). New South Associates Inc., Stone Mountain, Ga., has been awarded a $40,000,000 labor-hours contract for terrestrial and marine archeological investigations, historic architectural services, architectural history, archival and knowledge management services, Native American Graves Protection and Repatriation Act summary and inventory services, Geographic Information System and Global Positioning Systems services and related modeling, and historic studies in support of cultural resources investigations; as well as collections management, rehabilitation, conservation and curation services, and other types of museum support. Bids were solicited via the Internet with four received. Work locations and funding will be determined with each order, with an estimated completion date of August 8, 2020. U.S. Army Corps of Engineers, St. Louis, Mo., is the contracting activity (W912P9-17-D-0012). United Excel Corp., Shawnee Mission, Kansas, has been awarded an $8,943,254 firm-fixed-priced contract for renewing and repairing the Roll Dental Clinic at Fort Leonard Wood, Missouri. Bids were solicited via the Internet with six received. Work will be performed in Fort Leonard Wood, Mo., with an estimated completion date of August 9, 2017. Fiscal 2017 operations and maintenance (Army) funds in the amount of $8,943,254 were obligated at the time of the award. U.S. Army Corps of Engineers, Huntsville, Ala., is the contracting activity (W912DY-12-D-0015). Eastman Aggregates Enterprises LLC, Lake Worth, Fla., has been awarded an $8,605,564 firm-fixed-price contract for beach erosion control and hurricane protection, Miami Dade County, Fla.. Bids were solicited via the Internet with eight received. Work will be performed in North Miami Beach, Fla., with an estimated completion date of June 5, 2018. Fiscal 2014, 2015 and 2017 operations and maintenance (Army) funds in the amount of $8,605,564 were obligated at the time of the award. U.S. Army Corps of Engineers, Jacksonville, Fla., is the contracting activity (W912EP-17-C-0015). Raytheon Missile Systems, Tucson, Ariz., is being awarded a $32,291,652 modification to a previously awarded contract (N00024-17-C-5409) for procurement of long-lead material in support of fiscal 2017 Standard Missile-6 full-rate production requirements and spares. Work will be performed in Camden, Ark., (71 percent); San Diego, Calif., (9 percent); Middletown, Conn., (9 percent); Amesbury, Mass., (3 percent); Andover, Mass., (2 percent); Irvine, Calif., (2 percent); Verdi, Nev., (1 percent); Needham Heights, Mass., (1 percent); Anaheim, Calif., (1 percent); Warrington, Penn., and Union, N.J., (less than 1 percent each); and is expected to be completed by March 2020. Fiscal 2017 weapons procurement (Navy) funding in the amount of $7,668,534 will be obligated at time of award and will not expire at the end of the current fiscal year. The Naval Sea Systems Command, Washington, D.C., is the contracting activity. Rolls-Royce Marine North America Inc., Walpole, Mass., is being awarded a $27,270,004 firm-fixed-price, cost-plus-fixed-fee, cost only modification to a previously awarded contract (N00024-07-C-4014) for the procurement of provisioned item orders, and an increase in engineering services and associated support ceiling for DDG 1000 class turbine-generator sets. The DDG 1000 class main and auxiliary turbine-generator sets provide the ship’s primary source of electric power. The turbine-generator sets include the gas turbine engines, generators, control systems, and mounting equipment necessary to generate power for the DDG 1000 class of ships. Work will be performed in Indianapolis, Ind., (60 percent); and Walpole, Mass., (40 percent), and is expected to be completed by September 2022. Fiscal 2017 shipbuilding and conversion (Navy) funding in the amount of $1,025,000 will be obligated at time of award and will not expire at the end of the current fiscal year. The Naval Sea Systems Command, Washington Navy Yard, D.C., is the contracting activity. Bethel-Webcor JV-1, Anchorage, Alaska, is being awarded $23,698,000 for firm-fixed-price task order N4425517F4132 under a multiple award construction contract (N44255-17-D-4032) for design and construction of the Triton Mission Control Facility at Naval Air Station Whidbey Island (NASWI). 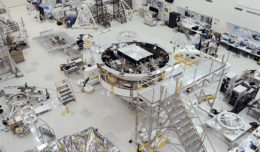 The work to be performed provides for all labor, materials, equipment, and associated costs to demolish the existing Building #243, and construct a one-story Triton Mission Control Facility. The scope of this project also includes a broad area marine surveillance earth station antenna site on NASWI’s north quadrant, emergency generator, electrical utilities, paving, and site improvements. Work will be performed in Oak Harbor, Washington, and is expected to be completed by April 2020. Fiscal 2017 military construction (Navy) contract funds in the amount of $23,698,000 are obligated on this award and will not expire at the end of the current fiscal year. Thirteen proposals were received for this task order. The Naval Facilities Engineering Command, Northwest, Silverdale, Wash., is the contracting activity. RQ Construction LLC, Carlsbad, Calif., is being awarded $8,627,801 for firm-fixed-price modification 33 to increase the maximum dollar value of a previously awarded indefinite-delivery/indefinite-quantity contract (N62473-10-D-5409) task order 0012 for the replacement of air handler units, ductwork, infection control measures, and associated repairs in Building 1H at Naval Medical Center, San Diego. After award of this modification, the total cumulative task order value will be $61,179,110. Work will be performed in San Diego, Calif., and is expected to be completed by October 2018. Fiscal 2017 operations and maintenance (Navy) contract funds in the amount of $8,627,801 are obligated on this award and will expire at the end of the current fiscal year. The Naval Facilities Engineering Command, Southwest, San Diego, Calif., is the contracting activity. Cape-Burns & McDonnell JV, Raleigh, N.C., is being awarded $8,382,508 for firm-fixed-price task order N3943017F4054 under a previously awarded multiple award construction contract (N39430-15-D-1631) for cleaning, inspecting, and repairing of fuel storage tanks 48, 54 and 55 at Joint Base Pearl Harbor Hickam (JBPHH) Pearl Harbor. Work will be performed in Pearl Harbor, Hawaii, and is expected to be completed by November 2019. Fiscal 2017 defense working capital (Defense Logistics Agency) contract funds in the amount of $8,382,508 are obligated on this award and will not expire at the end of the current fiscal year. Six proposals were received for this task order. The Naval Facilities Engineering and Expeditionary Warfare Center, Port Hueneme, Calif., is the contracting activity. RAMSYS GmbH, Ottobrunn, Germany, is being awarded a €10,570,461 and $5,382,479 firm-fixed-price order N0002417F5444 to a previously awarded basic ordering agreement (N00024-15-G-5402) to provide the Evolved Radio Frequency Receiver affordability technology refresh effort and establish an option to deliver hardware utilization matrix hardware. This contract includes options which, if exercised, would bring the cumulative value of this contract to €10,570,461 and $9,700,566. Work will be performed in Ulm, Germany (94 percent); and Ottobrunn, Germany (6 percent), and is expected to be completed by May 2021. German funding in the amount of €10,570,461 and $5,382,479 will be obligated at the time of award and will not expire at the end of the current fiscal year. This contract was not competitively procured, in accordance with10 U.S. Code 2304(c)(4) (international agreement). The Naval Sea Systems Command, Washington, D.C., is the contracting activity.